Power Clean and Press Exercise for a whole body workout. Clean and Press Exercise is a complete body workout involving almost all major muscles. It is the Most Effective Full Body strength and conditioning drill. Check how to do Clean and Press Exercise to build shoulder muscles and total body density and explosive power. Purpose -- To Build Muscle Mass and strength in the shoulders, upper body, quads, hamstrings, back, biceps, triceps and whole body power. Did I miss something coz' Clean and Press doesn't ! Clean and Press Exercise involves the shoulders, legs, triceps, trapezius and back muscles making it a whole body workout and great for a total body workout if you are short on time. This exercise is performed using a bar held in overhand grip. You can also use a Kettlebell. Grips-- Hands are positioned shoulder width apart. Stance: This step is important because your stance will help prevent lower back problems in this exercise. Step 1: Get into a squat position with thighs in parallel with the floor and grab the barbell with an overhand grip. Your head should be straight with your eyes focused in front of you. Go deeper than shown in the picture. Step 2: Now using the legs lift the bar with arms straight up to shoulder height. 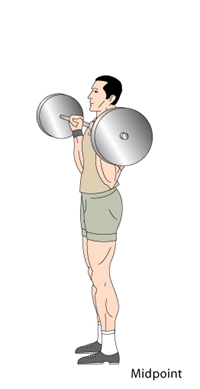 At this point you are at the starting position of shoulder press exercise. 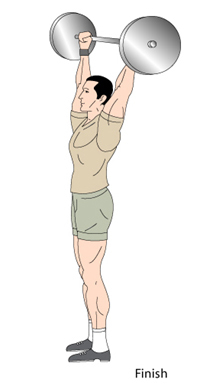 This is actually the midpoint position unlike the regular military press or shoulder press wherein you lift from the shoulder height. 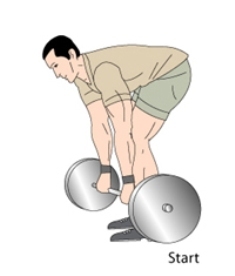 Step 3: Now press the weight overhead, pause for 1-2 seconds then bring it back to midpoint position. Step 4: Just reverse the cleaning movement and get the weight back on the floor. Once you have finished the last repetition, you can do partial-press exercise wherein you do a regular shoulder press exercise with bar starting from shoulder height instead of cleaning it from the floor. Ideally do partial reps only for the last set for high intensity workout. Remember exhale while you exert. Perform a warm up with 50% weight for 1-2 sets. Keep your lower back and abs tight throughout the move. Clean and Press can be difficult and uncomfortable. You can avoid it if you are not comfortable. But many powerlifters and bodybuilders love the results this exercise generates. Do 5 sets of 5 reps - the standard 5 X 5 protocol for building strength and power. Always perform the Shoulder Exercises before you perform triceps. This sequence is very important because if you do triceps before shoulders, the triceps will fail before deltoids and you cannot lift heavier in shoulder press thus not stimulating delts enough. 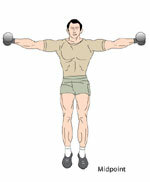 Lateral Raises - Later Raises for broad, round Shoulders. Build Boulder Shoulders Now! This all time favorite exercise is a must for a complete Shoulder Workout. Click here for Lateral Raises Exercise. Back from Clean and Press Power Exercise to Weight Training Home.